I didn’t think it would be possible for me to be as happy about my body as I am right at this very moment. My weight loss journey began on January 5th 2013. I didn’t want to make a cheesy New Years Resolution because every time I do, I don’t keep it. I was afraid of jinxing myself, so I decided that I wasn’t going to do it. But then I started thinking about it and figured, what’s the harm in saying I want to lose weight, but not because I feel obligated to make a New Years Resolution, but because I want to lose weight and be healthy. Not just go on a diet, but try to change my eating habits for good. 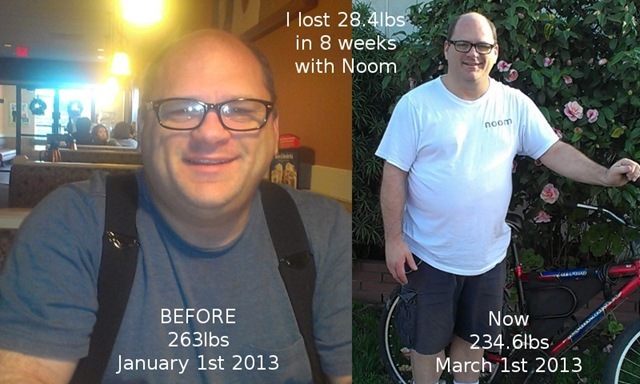 As I was looking for a new weight loss app, I found Noom right on the Google Play Store page on my new HTC One V from Virgin Mobile. It was a free app so I figured what the heck, let’s install it and see what it looks like. I fell in love with it right away because of all of the things it can do compared with some of the other diet apps I had installed. I wanted the pro version, so instead of paying a monthly fee for it, I just paid for it for life. I know, I should have played with it to see how it would work for at least a week or so, but I already knew it was going to help me lose weight, and well, here I am today. This is only half of my weight loss journey though, not even half yet. I want to lose 63lbs, so I still have a way to go. I know people are going to ask what I did to lose 28.4lbs in 2 months. Well, I logged everything I ate everyday in the Noom app. They have Green foods, Yellow foods and Red foods. So say you are eating vegetables like Broccoli or Brussels Sprouts, those are green. The Weight Watchers Smart Ones frozen dinners are green, and that is what I ate for lunch and dinner every day for the last 2 months. Basically, I’ve been trying to eat anything and everything that is green, but I have been eating a few yellows and reds here and there because you can have them, just not as much as the greens. Just to note, I am not just going to eat healthy to help me lose weight. I am changing the way I think about food and I do plan on continuing to eat healthy after I have lost all the weight because I want to stay healthy. I do not want to gain the weight all over again. I’ve also been learning what is in the food that I have been eating that made me fat and that is also my motivation to eat healthy. They say you can’t teach an old dog new tricks, but this old dog is learning new tricks everyday and will stick with it. I have been making my own peanut butter and sugar-free strawberry jam and sugar-free applesauce and even making my own banana ice cream. I have also been finding recipes for healthy treats like cookies made out of fruit and oatmeal. Those are really good. I made a recipes page on my website that I thought I’d share. I’m still adding more when I find them. The only thing I have not done yet to help me lose weight is exercise, and I have a very good reason. I have tried to go for walks, and we went out a few times in the beginning, but I have degenerative disc disease in my lower spine which makes walking very painful. I can ride the bike because I am sitting down, I just can’t walk for too long. The back wheel on my bicycle kept deflating because the rim tape broke and I didn’t know it, but I have fabric rim tape on it now and the tube is filled with air so I can finally start riding again. Thankfully my back doesn’t hurt when I’m on the bike. So, like I said, I am only halfway there. I just wanted to give an update of my current progress. See you again when I have lost all 63lbs. Is coffee with creamer going to prevent weight loss?